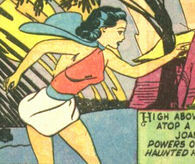 Powers/Abilities: Able to alter, shrink or create matter out of thin air. Able to fire energy bolts from her hands. Able to shrink herself to a tiny size. History: Reporter Joan Dale had an hour to kill before she had to meet with her boss, so she took the ferry to visit the Statue of Liberty on Bedloe Island. Sitting on a bench, she looked up at the Statue and speculated about the good a person could do if only "they had the powers that the Statue of Liberty must possess". Then she fell asleep and had a dream where the statue came alive, proclaiming it had heard her speech and was going to grant her magic powers to give her country the help that it needed. Joan awoke, promising that she would never let the statue down, only to discover that she had genuinely gained superhuman powers. True to her word, Joan made herself a costume, and became Miss America. Comments: Created by Elmer Wexler. Miss America appeared in Military Comics #1-7. Micro hero used on this page courtesy of Darrin Wiltshire's Micro Heroes site, used with permission.